I always thought it would take a bushwhacking expedition to a remote and endangered old ponderosa pine stand to see this bird. As it happened, one appeared outside the ranger station window right in town yesterday. Nancy the receptionist spotted it first, and the news spread down the hall. Sure enough, it was a white-headed woodpecker (Picoides albolarvatus) clinging to the puzzle-bark of one of the pines in front of the office. This is the first one I have ever seen. Modern forestry practices and fire suppression have fragmented and altered their habitat, which has resulted in a population decline. Large mature ponderosa pines and snags have become rare, perhaps more threatened than coastal old growth. 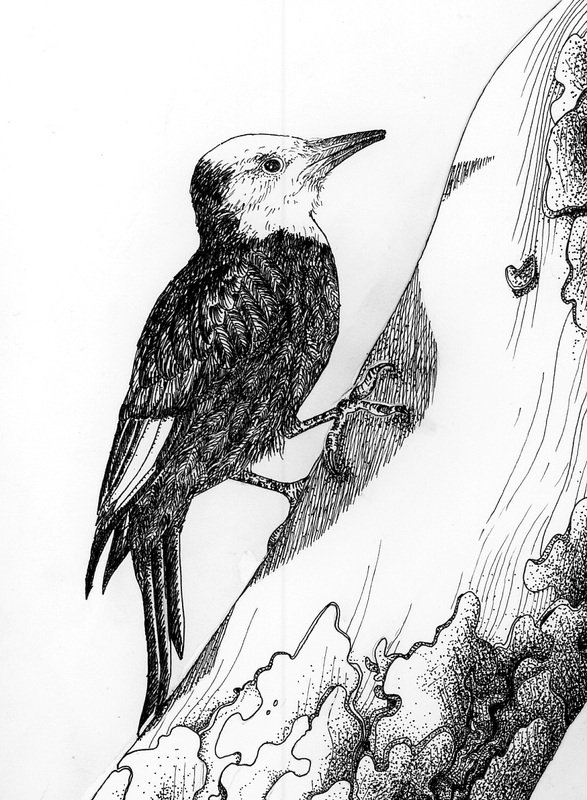 The Forest Service considers the white-headed woodpecker a species of concern, and it’s on the Audubon Society’s watch list. The ranger station was built in the 1930s, and is surrounded by stately old pines with native vegetation underneath. As this area grows and urban boundaries expand, our patch of ponderosa pines is an island in the middle of development. Maybe this little chunk of public land has more value than just a site for an office, a warehouse, sheds and a parking lot. This particular woodpecker had a small patch of red on the back of its head. A male. In the way of woodpeckers, it seemed to know it was being watched and nonchalantly hopped around to the back of the tree. Maybe not seeing us would make us go away. Previous postOut Like A Lion? i saw two white-headed woodpeckers, both with red on the back of their heads, feeding and chasing each other around the Ponderosa Pines in our yard. (We live in Leavenworth, WA.) It was a real treat! Thanks for sharing your stories. I very much enjoy! Last year, in mid-winter, Stan and I saw a white headed woodpecker on a ponderosa pine just outside our office window at the “PNW” house. That same week, while I was skiing out toward the new horse park, I had another sighting. They do like our old remnant of old habitat in the middle of town. Glad you reported it. We have a couple of photos of the bird we saw outside the window.